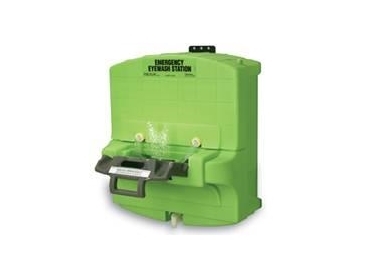 Emergency eyewash stations and personal eyewash products from Sperian are designed to provide initial treatment to minimise the effect of work-related eye injuries caused by hazardous eye contamination. Exposure of the eye to chemicals, toxins and foreign bodies must be treated immediately. Lack of immediate attention can lead to serious eye damage or even blindness. Work-related eye injuries are ‘an important problem’, according to a 2008 Australian Safety and Compensation Council report, resulting in over 500 hospital admissions a year. Recovery from eye injuries can take up to two days leading to significant loss of productivity in the workplace. Recognising the importance of initial treatment in minimising work-related eye injuries, personal protective equipment (PPE) specialist Sperian Protection (now part of Honeywell) has developed a range of delivery systems and devices that provide optimal emergency eye care in the workplace. Containing Eyesaline, a preserved and buffered saline solution superior to tap water or water with a preservative, Sperian’s range of emergency eyewash stations and personal eyewash products delivers flushing fluids to decontaminate the eye area. In addition to Sperian’s emergency eyewash stations and personal eyewash products, Sperian recommends its range of specialised safety eyewear such as the Sperian DuraMaxx Goggle, and the Sperian Millennia Sport safety eyewear.